Equatorial Guinea took another step towards becoming a major naval power in the Gulf of Guinea on 3 June when it inaugurated a new frigate in the capital Malabo. “This warship is the flagship of the Equatorial Guinea Navy and it will [help] to ensure security in the Gulf of Guinea,” President Teodoro Obiang Nguema Mbasogo said during the inauguration ceremony. The Equatoguinean media claimed the frigate, Wele Nzas (F 073), was built locally.However,IHS Jane’s understands that it was largely built by MTG Dolphin in Varna, Bulgaria, as the ‘salvage and rescue’ vessel Savior (IMO: 9664500) under Project SV 02. It was then outfitted with combat systems at a naval shipyard – thought to be Astilleros de Guinea Ecuatorial (ASABA GE) – in Malabo. ASABA GE was established in 2010 with Israeli assistance, although Ukrainians are also involved in running the shipyard. The warship’s keel was laid down on 21 May 2012 and it was launched in Varna on 26 February 2013, according to IHS SeaWeb data. The outfitting of the ship at Malabo in a 210 m navy-owned floating dock was well underway by November 2013,according to a South African Navy article covering the port visit of its Valour-class Meko A-200 frigate SAS Spionkoep to Malabo that month. commissioned in January 2012, the Wele Nzas was designed by the Ship Research and Design Center in Nikolaev, Ukraine. Weapons and combat systems are also largely sourced from Ukraine, probably from the company Impulse 2, which has outfitted other warships in Malabo. Like Bata , the Wele Nzas was procured from Bulgaria using various entities in Panama and the Comoros. With an overall length of 107 m, a beam of 14 m and a draft of 3.7m, Wele Nzas is about 20 m longer than Bata. Estimated displacement, based on similar Ukrainian corvette designs, is around 2,500 tonnes.The propulsion system comprises four Caterpillar C280 diesels (Bata has two) driving two screws for a top speed of 25 kt. It is unclear if these are 12- or 16-cylinder engines. Range is 5,000 n miles. Wele Nzas has a raised helicopter deck amidships. The ships’ boats are housed in partially enclosed hangars amidships. These are covered by a sliding screen, with the boats launched by a swinging davit. The combat systems are also an improvement on Bata ‘s capabilities. 76.2 mm AK-176 guns are fitted both fore and aft, two MS 227 multi-barrelled rocket launchers are fitted forward,while two 30 mm AK-630M guns mounted besides the funnel stack provide close-in defence. Primary sensors include a dome-enclosed radar – most likely a Positiv U set – on the foremast, two navigational radars and a Delta-M radar on a mast located ahead of the funnel stack. The Delta-M is thought to be interfaced with the Cascade integrated self-defence system that provides targeting data for the AK-176 and AK-630M guns. Equatorial Guinea is currently engaged in a major, but little-reported naval expansion. In recent years it has acquired four Bulgarian-built ships (two PV 50 patrol vessels, as well as Wele Nzas and Bata ),two 62 m offshore patrol vessels, two Shaldag fast attack craft from Israel Shipyards, and a Chinese-built 91.45m roll-on/roll-off landing ship. kudo to our neighbours. they are updating their arsenal at a good steady pace. we really need a national security and strategic review. our years of UN PKO have really distracted us and we took our eyes of the ball. we really need to assert our dominance, as biggest economy in africa should also translate into potent military power. pax nigeriana should still be a reality. el jefe is doing a good job security wise in equitorial guinea. In terms of greenwater capability, only SA and Nigeria now look like they can hold a torch up to this little sister republic in all of sub-Saharan Africa in terms of capability. TWO oceangoing assets – a corvette and a frigate – and they have a Barrosso-class corvette this size also on order. To retain the leading edge, NNS Aradu has to be put back to sea in fighting form, what could be a gift of a Type 53 frigate from China followed through while we seek a credit line from China Exim Bank to acquire FIGHTING SHIPS namely, a Type 054 frigate and two Type 056 corvettes. For now, our incoming P18N stealth OPVs possess precisely this level of firepower in the absence of AShMs, namely 76mm naval artillery and 30mm CIWS. We must keep our eyes on the ball. Our Neighbours are slowly but surely arming up, we dey dance azonto…..na till small country disgrace us again we go wake up, the Chinese ships should hv set sail immediately plus the gifted ship…how come no chatter on it again?. Last we heard, the handover formalities and possibly, refurbishment, were underway. The combat ship shall arrive in no time. I want to believe that she might sail in with the first P18N stealth OPV this July/August. General Beeg, good to be back here again. I thought the Wele Nzas is already in Equatorial Guinea? Anyway, the ship as described by Janes is missile-less in its current state but there are probably provisions for such. It surely outguns the Hamiltons, and its shape shows stealthy attributes. So we have a non Nigerian frigate in the Bight.We must not detour off SG-02 more than ever.We can’t afford to.Get Aradu back to her station.Put in place plans to arm NNS Okpabana and NNS Thunder at a moments notice,the same way the U.S. armed WHEC Mellon. x1 Mk15 Phalanx CIWS (cylinder aft of the helicopter deck). x2 BushMaster Mk38 25mm Chain Gun. Post Cold war it was deemed too powerful and stripped. That is a ruthless panoply right there. So let us get the Israeli alternatives to those armaments and see if we can have one of the Hamiltons as heavily armed as that. If we get the Aradu up and running and receive a gifted Type 53 frigate from China, a Hamilton-class ship outfitted as such would give us three frigates at once. That way, each one of WESTCOM, CENTCOM and EASTCOM have a frigate as leadship. We should strive to give each command a Type 056 corvette and a P18N stealth OPV as well. EACH of those should be backed up by a 1,041 ton long range Cat-class multipurpose vessel, a minimum of three 38-56m Midshore Patrol Vessels and six 24-32m coastal patrol craft. We need a LPD to replace our old LSTs. If money be the problem, the US$50 million Makassar-class LPD made by Daewoo remains a sure bet. About time we placed an order for a Type 054 frigate as well. 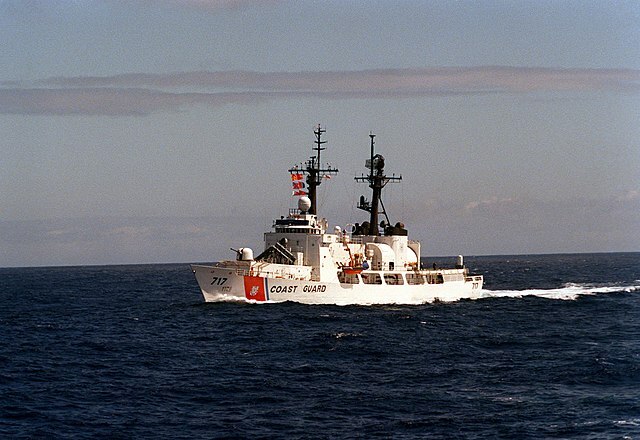 They (the ex-USCGC 378 ft cutters) never had all those weapons at the same time. The torps were gone well before the Bushmaster came onboard, and I think they MAY have been taken off BEFORE Harpoon was (temporarily) installed. The Mk 64 I believe is the chaff launcher. Two Z-9 Harbin ASW helicopters with C-803 anti-ship missiles can be used to arm our P18N since the Chinese Admiral said they will not carry any anti-ship missiles and I see oil spill control tanks fixed amidships where AShM missiles would normally be located. The fact is that you always need two Z-9 helicopters for ASW operation because one Z-9 can only carry either a torpedo or a dipping sonar at a time, not both equipment, so you need two Z-9 helicopters to do anti-submarine warfare, one will carry sonar, one will carry torpedo. Not sure USA will allow us to arm NNS Thunder and NNS Okpabana with missiles, who knows what terms and conditions they made us to sign in the ‘gift’ agreement papers. I don’t see America selling harpoon missiles to Nigeria under Obama. Sometimes we Nigerians just like to shout and clap for matter wey no benefit us….all the noise and fund raising for Obama to become president done by Nigerians, what has this country gained from him? Clinton’s regime was better for us. The ships we got are not his private gift in my own opinion, I think they are US national policy generated. Please fully refit NNS Aradu and test fire all her missiles, Otomat and Aspide against a target, let us see them explode, test fire all guns and torpedoes against real targets. Add a CIWS gun for self defence. NNS Aradu needs brand new engines. Nigerian Navy Admirals, we all trust you. May God reward your efforts, we Nigerians will not forget that you always make us proud. RE uparming NNS THUNDER – there are no restrictions in the Letter of Offer and Acceptance that prevents Nigeria from mounting whatever weapons Abuja sees fit. Naval Architecture (space, weight, stability, electrical capacity) WILL be a problem. A new Combat Information System is a more pressing need. I keep insisting that Nigeria should fully prepare a blue water force that can stop an hostile naval blockade of our oil and gas business. War does not always write letter of intent all the time. Britain woke up one good morning and realized that Argentina’s navy was ruling the waters of British territory Falkland Islands in 1982….that was the biggest modern naval battle in history….it was won by Britain….the submarine advantage. Argentina’s army on Falkland Island was cut off from their home country Argentina, by the Royal Navy’s perfect naval blockade of all relevant Argentine oceans. The rest of the story is a big lesson for all wise men. I think we are beginning to wake up to the fact hat the ARADU needs to be repaired and refitted. The U.S GOVT has given Nigeria two warships in three years any item that comes under the RADAR of being gifted to an ally comes under the advisement of the President i.e. he will be advised either to sign yea or nae on it. As we speak there are Nigerian naval sailors being trained in the US for chump change TO THE Nigerian Goverment yes there is a lot that the US AND Nigeria need to work on however it is incorrect to say President OBAMA has not done anything for Nigeria. I endorse a continuation of US-Nigeria DEFSEC engagement. It is just as strategically important as Sino-Nigerian relations. Strong mutual engagement with the Chinese and Americans is working well in Pakistan, and Thailand and Indonesia and I believe it is going to work well in Nigeria. America being America, they have their own bounds and limits which is steeped in their own values and we cannot prescribe what they should hold dear. If that be the case, it is up to the pivots of US-Nigeria DEFSEC relations to carefully examine the reality on ground in Nigeria and navigate around the constraints in an intelligent way. We have a need for transport eg C130s and surveillance assets and defensive gear – flak jackets and uparmored Hummers for example. If those can be obtained, let us reach for these Excess Defense Articles and quit the sanctimony. There are no babies in the room, so there is no need for teleguidance on most matters. Nigerians being a fiercely proud people, they are wont to instantly make a detour for Plan B, with or without expressing their misgivings. While our former colonial masters have laid a media siege on Nigeria and done scant little else in material terms, the USA who came to the party as joiners have in one decade transferred four 1,041 ton ships and two 3,250 ton ships to the NN. They have helped with the emplacement of a qualitative coastal radar system and paid for the restoration of a C130. Earlier in the 2000s, Nigeria received a free significant American consignment of mortars and Browning M2 machine guns as well. They have been good friends in the main and friends do have tiffs from time to time. Some might talk a lot of nonsense at times but NOBODY ELSE but the Chinese would be nearly as useful to us as the Americans in DEFSEC terms and as far as hardware goes. The rest of them are just mere talkers who do not walk the talk as a rule. As far as training goes, Israel, India and Pakistan would stick firmly and stand together with us even if they are not able to offer EDAs like America or China can. And they will sell what we need sans any sermons or grandstanding. There shall be no F16s, no Apaches or M1s coming our way. That is what America’s own reality suggests. So let us get the Type 054 frigates, Type 056 corvettes, JF17 Thunder and BigFoot MRAPs from the Chinese who have no hangups. That is the way the real world works. No need to begrudge the USA who have been useful allies to us in the main. They cannot displease themselves to please us. In our bilateral DEFSEC relations, they should try, hard as it might be, to pretend that we are equals and they need to tone down the prescriptions. Big mouthed officials who come to engage with us in Nigeria and return to Washington to run us down at the first sighting of a CBS microphone, should be kept away from the roundtable. We seek partners who are outspoken at the roundtable but taciturn in public. That is why Alice Friend was such a drag on useful US-Nigerian relations. Real politik – we need offensive systems and if US values and ethics do not permit that, let us grab those from China, Israel and Russia. We do not want our cutting edge blunted if, in sync with laid down policy, we are at the receiving end of U.S military sanctions such as we have known previously. Long live US-Nigeria relations. God grant us the serenity to accept the things we cannot change and the courage to change the things that we can. I say this wothout the slightest hint of bitterness. Most of your points are valid Oga Beegs. BUT, the truth remains that we should never be content with crumbs from the table of the U.S. And there is a limit to trusting the U.S- they will stab you in the back when you are not looking-for sure. They have turned their backs on enough of their “friends” for Nigeria to have no illusions.. Despite our challenges, Nigeria remains a fiercely proud nation with unlimited potentials limited only by the quality of it’s leadership. We should just learn to play dynamic politics, playing off the U.S, France, Britain against Russia, China etc. 🙂 🙂 Ruggedman…dat 2.5 kobo dey hot o.
I agree with you Augustine. Us African are myopic and sentimental for no good reason. We Africans are expected to hate the Conservative Republicans by default and embrace the Liberal Democrates by default but we fail to realise that Conservatives have a track record of not being sentimental and blunt but less hypocritical. Bush visited Nigeria twice when in office at a time the thought of terror was never imagined in the eyes of Nigeria. Last week on Fox i watched bemused as a Republican senator dramatically made a case asking why America is not intervening in Sudan to stop the orchestrated genocide, he cited Somalia and how years later Clinton regretted not intervening to stop the Genocide and warned a repeat is about to happen. Condoleeza Rice, Collin Powell, George Bush all visited Nigeria. Today we have a black man in power, Africans were elated on the news of Obama;s victory, i remember my dad calling his friends telling them congratulations and popping a bottle of red wine. Down stars clusters of people were drinking and happy. In Kenya a public holiday was announced and all Africans assumed with a black man in Power finally Africa will be given priority and attentio. Fast forward 6 years later whats the situation? Just today the Obama administration slammed travel and economic sanctions against Uganda, Hillary Clinton has repeatedly bad mouthed Nigeria, Obama has been to Africa twice but Nigeria and Kenya were not part of his planned tour instead he went to Ghana to declare how Ghana was a symbol of real democracy and progress in power. Its Ironic Obama only responds to Africa only when he cannot get away with it. The same President who released for Taliban terrorists for one American soldier despite America’s staunch and rigid policy of not negotiating with terrorists. You have to think that perhaps if Bush was in Power America;s war on terror will not be based on sentiment and procuring arms to fight terror from America will be swift and approved. Oga Oje, if you are myopic and sentimental, why would someone listen to you? Why do you deserve any better. Unless of cause, you are not African. Or you are special. Africans wanting Obama to win the US presidential race was very natural. The same way the Chinese would want a candidate with a Chinese father to win, if there’s ever such a candidate. Why are we acting all hurt like its our birth right to receive military hardware from America? Ok since America has repeatedly turned down procurement overtures why havent we turned to Russia? who are we kidding? They gave us two Warships free, why cant we procure Migs or Flankers from Russia? We are so addicted to blaming others for our woes its becoming pathetic. We are spending $6 billion on defence between last year and now but where has the money gone? to pay salaries? or cutting corners buying turbo prob air crafts? Equatorial Guinea has arguably the second most powerful Navy in West Africa and this acquisition proves it. Lets desist from making excuses for our corrupt leaders by blaming others when we should be putting our house in order. Heehee…Sir Oje, it seems like you woke up on the right side of the bird this morning. Insightful post. My bad I meant “Bed” not “bird”. Bros u dey vex o.
Shay, 4G jets have surely now been acquired? Wetin u still dey yab on top again? The acquisition of the ALX Super Tucano was as FAULTLESS a decision as the acquisition of the BigFoot MRAP insofar as it completes a solid COIN airframes’ array – ALX Super Tucano COIN aircraft with 4G tech, Mi-35M night attack helics, Mi-171Sh night assault helics, Mi-24V/Mi-35P attack helics and Mi-17 transport helics. By the time that this conflict is over, we shall have a crack, well resourced and battle-hardened Air Strike Group and army division which shall be coveted across the continent and matched only by the Algerians for experience and equipment. Oga Beeg, if it is your views that the Embraer aircraft is a good aquisition i have a right to defer and make a case why its the worse possible acquisition. Cheap Acquisitions like this with delibrate negligence and long term foresight are what fuels corruption in our once proud military establishment.Our air force is near extinction and to think the purchase of Tucanos as front line fighters is an acquisition in the right direction then you are mistaking. Abeg shey if we MIG-29;s and Sukhoi Flankers are in bound and them strap you put for the Tucanos to intercept an aircraft flying at Mach.1.5 you go gree take off abi? The heavy lift capability of our C-130 fleet is the only feature that distinguishes our airforce from most other sub-Saharan African air forces, If i am not mistaking as at this moment we have eight C-130s, all in Lagos.The Tucano being a turbo prop it can only be used for field tactical missions and even at that it is sub sonic extremely less maneuverable hence easy target even to Rocket propelled grenade, it does not have air refueling probs hence is severely handicapped by limited range. In the event of a conventional war against a clear and defined enemy how will they fare against supersonic Migs or Fulcrums? Each time i raise this topic you slam it before it even sees the light of day. In the 80;s we were flying 4th Gen Jaguars, its 2014 we are flying Tucanos in very limited numbers and you call them 4th Gen assets? Everyday you rail and rail on how America is hypocritical and if given the chance you will blame them for our current predicament but no matter how much you do not like my views i will continue stressing it, spending $200 + million on jet trainers strapped with external fueltanks and rockets in a country at war is tragic, just like we spent $250 million buying Chinese versions of 1960 era Mig 21s. I advise that you re-assess your views on the Tucanos. With the right adjuvants- FLIR,BVR etc, they are extremely COIN-capable airframes. Vetted and validated even by my naughty “friends” the U.S.A.
Nobody ever claimed they were air superiority fighter jets. At this stage of our operations in the North-East, i don’t see them as a negative addition. On the other hand, the F-7s are one of the worst mistakes by NAF in airborne history. LOL…even the F7 dares not take off when the Su-27 is aloft. My point is this – the ship has sailed. We are in the middle of major COIN operations. Do we need counterinsurgency air assets? By all means, yes. Do we have a yawning and shameful gap in air superiority, multirole and deep strike assets? YES. The Tucanos are 4G yes, but for COIN operations.It has no job at all in air-superiority. Oga beeg is saying we have a capable COIN unit for most PK operations. In the future we should hand over the Mi35M’s to the army as troop transport/CAS and get a dedicated attack helicopter to ‘grease’ away the Hinds from the Airforce. As for dedicated air platforms. I personally believe the JF-17( if we get it) should be a work horse while we turn to a suchoi derivative for air-superiority.The range of the SU 30 is un-matchable (and this is without the idea of conformal external tanks), also its enormous radar aperture means that it will see the enemy and engage it before it is seen in-spite of its size. A component force of SU30s and JF-17’s means the SU can detect first and vector attack for the JF’s. The range of weapons of both aircraft are just staggering,we can never get from the west,the range of weapons the JF-17 and SU offer,considering that nations like China,India,Pakistan and Russia use them. H-4 (electro-optically guided),LS-6(satellite-guided glide bombs). 6× KAB 500KR, 3× KAB-1500KR, 8× FAB-500T, 28× OFAB-250-270. Anyway,we will soon know what they bought.It is a matter of time. We already use the PL-9C with our f-7’s,and they are HMS compatible.The JF-17 can also be armed with the C-802M air-launched cruise missile. Taking anything more than Tucanos, advanced A-jets or upgraded L39s into the North East is like taking a tractor into a garden. Best to be added to this should be night capable fighting Hinds as well as heavy lift choppers. Currently Nigeria has got all of this just some tweaking needed on these plat forms. You really don’t know what you are talking about. But I get you want a weaker NAF in the north-east. I guess you have got your reasons. But it ain’t going to work, the NAF has already started deploying 4th generation jets in the noth-east. Interesting read on the Flankers. Chief of air staff, Chief of defense staff, Minister of Defense, Senate president, Minister of Finance, First Lady Patience Jonathan (She will convince oga patata I will bet on that). After having our GDP rebased as Africa’s largest economy, how come we are still talking of Frigates? we should be looking at potentially acquiring Destroyers and subs and please! let no one tell me im being unrealistic. While some countries may not want to sell them to us, others do. 25% of our oil is being stolen every day …translate that to defense budget and you begin to see what im talking about. with all due respect to my more knowledgeable ogas, Aradu and co might still be serviceable but at this point and at this time they should be rounding off at the bottom of the list of our Naval platforms. oga, what do we need destroyers for? looking at our current maritime signature and ambitions, what can a destroyer do that the MEKO frigates cant do? have you studied the navy strategic plan? for assets such as submarines and LPDs, the navy has incorporated them in their medium-long term goal. acquisition of naval vessels is not a knee jerk reaction. our short term goal is to acquire more OPVs to enable us protect our EEZ. and the new partnership with the Chinese, means these platforms will be built right here in Nigeria. despite funding problems and competing demand, the NN still remain the only branch of the armed forces that has a clear vision and are quite articulate about it. the other two re either simply reactionary, or taking forever to induct platforms while remaining numb about recapitalization. it should interest you to know that most of these current frigates are actually destroyers, but for political reasons are still classified as frigates. @ oje, you are still finding it hard to understand the necessity of a dedicated COIN platform. we did not buy the tucanos to protect our airspace or to fight Sudan NO. they where purposefully bought to counter the ongoing insurgencies that is currently choking this country. the fast movers are not ideal for COIN warfare. they are not as effective as turboprop aircraft or helicopter gunships. platforms like the tucano can loiter for hours, act as eye in the sky protecting convoys, cheaper to fly and maintain, and most essential, carry a big punch. ground attack jets, though they can carry even larger stores, cant stay in a position for very long without burning through their tanks. i understand that you re concerned about the ‘survivability’ of the tucano due to its thin skin and you obviously would have preferred the A-10s ( or maybe the SU-25). yes these are armoured and rugged FGA, however, the A-10s are beyond our reach. as for the tucano, it all depends on tactics, thin skin or not. if they are properly utilized they will be a real thorn on the terrs and still return to base every single time! as for the 4G jets that you’ve been complaining NAF is not getting, be patient, that gap is soon going to be filled. so the tucanos’ acquisition is exactly like the MIL copters acquisition. they are meant for a different role, separate from the fighter jets and other assets in NAF orbat. we need more RPVs for these ISOs. the army needs a lot more mini UAVs and the SF teams need micro UAVs. ISR are not being fully optimized. there should be no surprises from hundreds of marauders in pick ups and motorcycles. hitting a town or village is one thing. but being able to withdraw cohesively with their vehicles and loots without any pinpoint survellance asset picking their signature shows untidy tactics from the 7 div. There is something wrong with this guy who keeps advocating for a weaker air force in the fight against the boko homos. Your point is that because a plane is high flying and jet powered then it is necessarily useless in a COIN war. Not always so. I think the mix we are calling for is based on operating envelopes; something like Tucano – FJ 17 – SU 30 for full domain dominance with a lot of interoperability thrown in. Tucanos are ideal for COIN but amongst the aircraft that took out complete Iraqi armoured columns in operation desert storm, F15s and F 16s were counted as much as A10 Warthogs. Added to that point, we have neighbours who need to be persuaded to do their bit to counter the bad guys. Having a proven capability to bomb them (BokoHaram) on foreign territory is a good incentive to our neighbours; act against BH bases or get disgraced. To prove that you can do that you probably don’t want to send in Tucanos but a long legged aircraft with payload backed by air dominance elements like the SU 30s. A new airforce air strip is being built in Bayelsa as we spesk, when completed it will be dedicated to providing dome semblance of air support for the Eastern Naval command. I dont think we need destroyers. What we need is a dedicated and extensive anti submarine warfare capability. One submarine can bring this nation to its knees. bayelsa is the home to NAF mobility command. they will build more than an air strip there. it is going to be a fully functional air base, with extended runway and hangar facilities. hopefully, they can speed up their recapitalization, because like oga oje mentioned, our lifting capability is the only feature that distinguishes our air force from others in Africa, at least, south of the Sahara. once upon a time the army had some fast deployed battalions that can be airlifted to hot spots and ready for action in less than 72 hours. some where 96 hours. today, with the depletion of that capability, neither the army nor the air force could meet those yesteryear’s operational capacity. 1) With Bayelsea now set to be part of the NAF mobility command, what is the role of the already established arm of the NN @ WARRI is one going to be strictly for the navy and the other for the airforce ? 2) With Extended runways are we seriously talking charlies ( C-130 ) or are we talking Johnnies ( JF-17) ? the reasons why i am asking and this is a valid question is longer / extended runways means bigger aircraft bigger payload for takeoff purposes. The NAF Air Mobility Command is HQed in Bayelsa. So the airstrip at Yenagoa dovetails into that and also, it would be a base from which the maritime security patrols of the Alenia ATR 42-500 ELINT/MPA Surveyor planes can be launched. You know how often they feature in NN sea exercises and in joint counterpiracy operations. The naval Command is so forward thinking it brings to chills to my bones.Thank you very much OGA Beegeagle. I dont think we need destroyers. What we need is a dedicated and extensive anti submarine warfare capability. One submarine can bring this nation to its knees. One submarine can bring this nation (Nigeria) to its knees. One lone Royal Navy submarine sank ARA General Belgrano the great Argentine navy battle-cruiser 12,000 ton massive warship that carried heavy artillery class guns and missiles, even Aradu is about 3,300 tons. Just 2 torpedoes and a 12,000 ton warship was sunk in hours by the British Submarine. The whole Argentine navy withdrew back to home base and NEVER showed it`s face on surface again in the war. This led to a defeat of their army on Falkland Islands as reinforcement was cut off by Britain`s submarine threat. Then funny side of the war, Argentina has one fairly good submarine apart from the obsolete Santa Fe, they had the San Luis submarine as the only naval presence for the rest of the war. San Luis had technical problems with her torpedo electrical wires, yet the whole Royal navy task force was afraid and kept busy using all ships, submarines, and helicopters to contain her sub-sea threat. Several times the Royal navy would not go where it should go without sticking together, for the fear of one lone and technically faulty Argentine submarine. The time has come for Nigerian navy to buy one or two units of Type 039 Song Class Submarines from China, one unit costs just about $250 million. The Chinese Song Class submarine surfaced in torpedo firing range of a US Navy aircraft carrier in 2007 without being detected by the whole American fleet until it surfaced and shocked everybody during US Navy combat exercises at sea ! South Africa took a bank loan to buy 3 Submarines for about $ 750 million. If they send one to stop Nigeria`s oil and gas business, Abuja will travel to Pretoria to go kneel down beg the people there o ! Amen to that Oga Augustine! How will buying two submarines negate the need to buy 4 ASW-equipped frigates? Are you suggesting that submarines are better ASW platforms than corvettes and frigates? In the modern world the question is being asked of submarines, what capability need are they filling?. Sneak attacks on shipping convoys, aircraft carrier groups, battleship groups et.c?. A small stealth ship will achieve the same objective at a fraction of the cost. So that’s it from the offensive side. From the defensive side the same argument, submarines will take out submarines but fast ASW ships will do the same. one submarine wont do it for nigeria. our naval design and ambition entails a minimum of 3 or 4 subs. as we wait for competing demands to allow us procure subs, we should be re-learning an old skill – anti submarine warfare. we had this maritime knowledge in the 80s, and lost it in the 90s. one cant overstate the importance of ASW. it shouldnt come as a surprise if we learn today that british, french, and american subs do carry out recon and other secret missions on our coastline. since we have been busy christening patrol vessels as fighting ships others have been busy preparing for the gulf of guinea energy grab. @oga jimmy, the mobility command is mirrored in similarity to the airlift command NAF had in the 80’s ( the 80’s was the peak of glory of the armed forces). so transport and air force logistics re top priority, but could perform other task such as maritime strike group and surveillance. as for the warri detach group, it is hoped that it would become a fully fledged Naval Air Station (NAS). there is good reason for this choice, Escravos and other oil platforms. Calabar would also have NAS. not forgetting the vulnerability of the calabar naval base due to our diabolical leaders giving bakassi to cameroun. Oga, this is set on GOLD. Ownership of one does not negate the need for the other. Serious navies have surface fleets, subsurface assets and an air component. To my knowledge, the NN launched her air arm in 1984-85 and by 1986, they were in the hunt for Foxtrot submarines. Here in Africa where Nigeria are domiciled, Algeria, South Africa and Egypt operate submarines and frigates simultaneously. For a country with a third of her US$125+ billion oil industry infrastructure situated out to sea, we badly need those submarines. Don’t forget to defend coastal anti-ship batteries with anti-aircraft missiles. It should be placed within a well defended area coming from land and air. The most probable attacks a coastal battery will encounter are from the air, or special forces assaults. As for submarines, having one available at all times require at least 3 hulls in the NN service. 1 submarine may not be enough, and I believe the NN has the capacity to acquire what is needed. Economically, Vietnam is way lower than Nigeria or the Philippines, but look what they got, 6 Kilo-class subs that China can be anxious of. REF submarines, I still think that those are on the cusp of entering NN service. The NN sent submarine crews to be trained in Pakistan as long ago as 2008 and the charting of our coastline and seabed by a Chinese oceanographic survey team in 2012, to my mind, was a precursor to the start of submarine operations. The NN shall be 60 come 2016. That will probably be the year to watch out for. I recall tellingly, that CSOC presented the Nigerian First Lady with a model of a submarine during the launch of the first P18N stealth OPV last January. These things do not always amount to token gestures. Last year, the boss of CSOC presented a model of a naval aviation ship ( a LPD). Since then, some folks with privileged insights have been insistent on the fact that the NN are in line to receive a miniaturised Type 071 LPD. Admiral Max on the Leyte Gulf…tis always a pleasure having you around here. I am sure, given the Israeli involvement, that Gabriel III and Barak missiles can be grafted onto her in no time. Ref the Hamiltons, I want to see what the Bangladeshis do with their sister ship BNS Samudro Joy. I hear that they want to install C803 AShMs on them. Already, the 1,800 ton ex-RN Castle class OPVs have had C704 AShMs installed on them and they are classified as corvettes. General Beeg, as far as I know, the Israelis are now offering their newer Gabriel V aka Advanced Naval Attack Missile. The Barak is also another great asset that can be considered. The Israelis did the same offers to us not only for the Hamiltons but for all other naval assets that the PN have. This new frigate of your neighbor, together with their announcements to acquire more ships should be used as a basis for Nigeria to give more for the NN. Although it may not seem to be a threat, a smaller neighbor with better arms should be considered a security concern, and may also hurt the NN’s pride being the navy of a larger country. It would be interesting to see what Equatorial Guinea’s navy will do with the ship, and if upgrades will be made soon. The NN’s Aradu is not a total loss yet, and can still be given the much needed revitalization it needs as the forefront ship of the NN. As for the WHEC upgrades, so far no movement on the BN’s Somudro Joy, also waiting if their plan to use Chinese missiles can proceed without US intervention. The PN’s Mk.38 Mod. 2 guns have arrived in the PH, and will be installed on the Ramon Alcaraz within the 3rd quarter 2014. A 3rd WHEC is in the negotiations with the Americans, and will depend on US government’s decision to proceed with the retirement of 2 WHECs within the year. A decision on the weapons and sensors system for the PN Hamiltons are expected soon as the PN will decide on the 2 new frigates by next month. This will include what systems will be installed that may have implications on the Hamiltons upgrade. BTW, a Pohang-class corvette is set to arrive to the PH before the end of the year, preparations are underway for the crew to be trained in Korea.